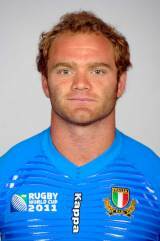 After making his debut for the national side in Cape Town against South Africa - Argentinean born centre Garcia has become an integral part of Nick Mallett's Italy squad. Having previously played for Calvisano, Garcia currently lines up for RaboDirect PRO12 side Treviso and his sole international try came against South AFrica in Udine in November 2009. He started one of Italy's five games during the 2011 Six Nations but it was their historic win over France in Rome. Garcia will hope to be part of more Italian upsets in the future having been named in Italy's squad for the forthcoming World Cup.